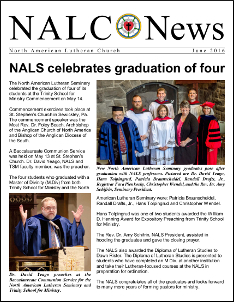 North American Lutheran Seminary celebrates graduation of four seminarians. Click here to download Nominating Committee Report for 2016 NALC Convocation including Biographical Information on Nominees. ‘Holy God, Holy Lives’ is theme for 2016 NALC Convocation. Braaten-Benne Lectures to focus on Person of Christ.